While the importance of collections has been evident in the sciences and humanities for several centuries, the social and cultural significance of collecting practices is now receiving serious attention as well. As reflected in programs like Antiques Roadshow and American Pickers, and websites such as eBay, collecting has had a consistent and growing presence in popular culture. In tandem with popular collecting, institutions are responding to changes in the collecting environment, as library catalogs go online and museums use new technologies to help generate attendance for their exhibits. Kevin M. Moist is associate professor of communications at Pennsylvania State University – Altoona College. He has written for numerous journals, including The Journal of Popular Culture, American Studies, Journalism and Mass Communication Quarterly, and Studies in Popular Culture. David Banash is professor of English at Western Illinois University, where he teaches courses in contemporary American literature, film, and popular culture. His essays and reviews have appeared in Postmodern Culture, Reconstruction, Bad Subjects, American Book Review, and PopMatters. His book Collage Culture: Readymades, Meaning, and the Age of Consumption is forthcoming in 2013. In editors Moist and Banash's volume on collecting, philosopher Stanley Cavell writes that "collecting for possession and display is as primitive as gathering food for survival." The contributors assess the growing significance of different impulses, forms, and manifestations of collecting as a cultural practice through a series of 13 provocative essays. Cavell's foundational treatment examines different collection guises from Homer to Walter Benjamin. In the section "Collecting in a Virtual World," the subject is things that occur in memory, ephemera, and cyberspace, such as 1960s provincial children's television. Banash's essay explores changing relationships to possessions in a post-material world, the reclamation of Pez dispensers (a candy-toy combination), and William King's meditation on a collection of nothing (cast-off secondhand items). The collecting and identity section visits baseball memorabilia that moves from a private collection to a stadium, Nazi cigarette cards (popular tales of Hitler avidly sought by German youth), and the Victorian women's collections that helped create a national narrative. A final section on collecting and hierarchy suggests a cultural anthropology accomplished through record collecting, Alex Jordan Jr.'s unintentionally comedic House on the Rock collections, and the evolution of curiosity cabinets into modern museums. Summing Up: Recommended. All readership levels. The idea of collecting as a reflection of historical and cultural development is examined in a series of scholarly essays written by various authors, differing from the usual price guides and how-to sources on collecting. An introduction gives an overview of the types and techniques of collections and collecting, as well as the arrangement of the essays. The 12 new essays and one reprinted essay are grouped into four basic themes: collecting in a virtual world, relationships between collector and their collections, collecting as a reflection of identity (both personal and political), and how collecting practices relate to cultural development. The essay topics range from whimsical to sobering (i.e., from toys to Nazi propaganda), from the curiosity cabinets of the seventeenth and eighteenth centuries to the more modern MP3 files. Each essay is followed by a bibliography and some are enhanced with illustrations. There is an index and information about the essay contributors at the end. 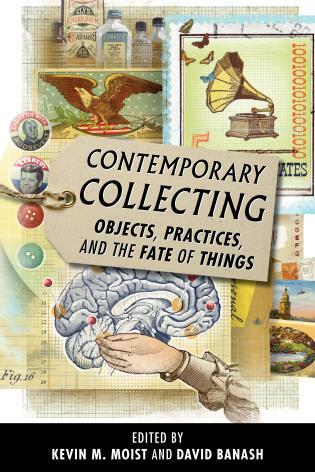 This is an interesting examination of collections and collecting that would serve as a beginning place for scholarly research. Covering a breadth of interdisciplinary perspectives and subjects—from PEZ candy dispensers and trading cards to sports memorabilia and music—Contemporary Collecting will be of interest to scholars of cultural studies, anthropology, popular culture studies, sociology, art history, and more.